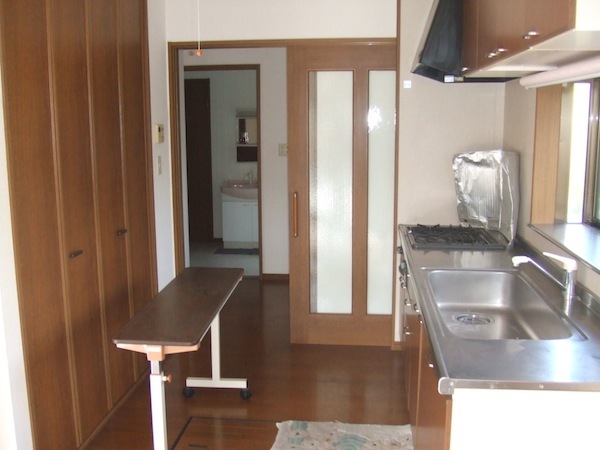 Situated on the edge of a huge rice field, the land that comes with this property is probably its most attractive feature, providing a sizable front yard, which the previous residents tried to make into a combination vegetable/Japanese garden. 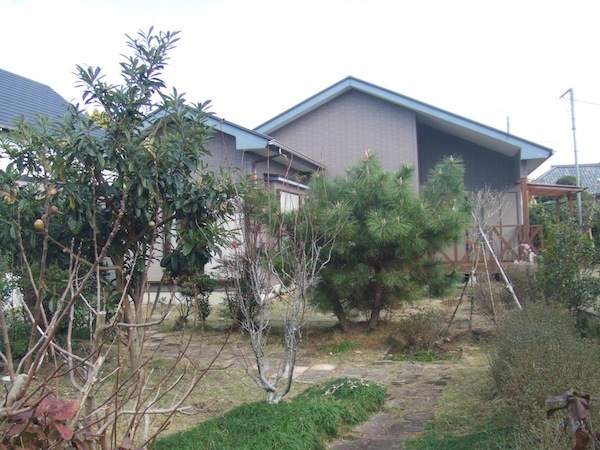 Considering how overgrown and tacky it’s become–not to mention the fact that the original asking price was ¥11 million–no one has obviously lived there for a while. The agent told us that the house was originally connected to its almost identical neighbor to the west. At some point the corridor that bound them was torn down, leaving a mysterious windowless storeroom off the bathroom as its only evidence of prior existence. 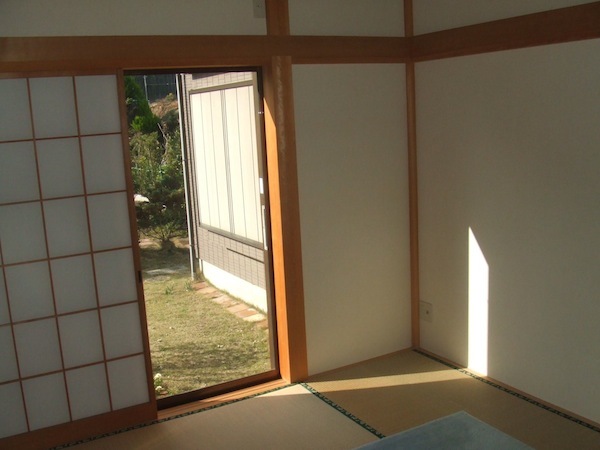 The layout was reasonable: two Japanese rooms situated in staggered parallel, both looking south; an open living/dining area perpendicularly positioned to the kitchen, which is large and airy. Despite the efficient use of space the rooms are darker than we like, owning mainly to the low ceilings and small windows. Also, a small wooden deck was built outside of the double sliding doors on the east side of the living room, facing the farmhouse next door, which is uncomfortably close. The agent said that someone still lives there though we couldn’t see any signs of recent life. It was the model of a derelict fire trap and would make any venture out on to the deck for purposes of enjoying the sunrise or whatever depressing. Verdict: House would need at least 3 million more to make is livable, and the land size alone, not to mention the distance from transportation, couldn’t justify the price.